Madolenihmw—The Madolenihmw Municipal government held its 10th inauguration at St. Augustine Church. Deacon Fred Martin gave opening prayer followed by welcoming remarks from Senator Shelten Neth, the Chairman of the Madolenihmw delegation at the Pohnpei State Legislature. The Chief Justice of the Madolenihmw Municipal Government administered the oath office for the members of the council. 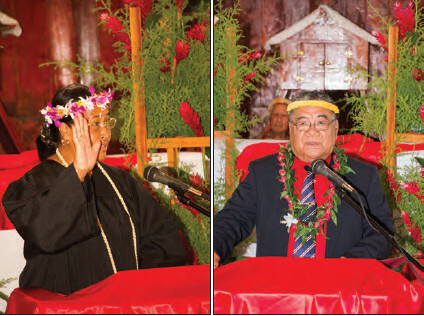 The Chief Justice of the Pohnpei Supreme Court administered the oath of office for Mayor Pretrick Ringlen who was elected to serve another term. The Inaugural Committee wants to recognize the import support of the following donors to the event. Hon. David w. Panuelo, Hon. Dion G. Neth, Menintiensapw, Micronesia Petroleum Corporation, Amcres, Ace Hardware, St. Augustine Church, and the Wapar Church. Pohnpei—The Attorney General’s office has filed criminal charges against former Director of the Office of Fisheries and Aquaculture, Casiano Shoniber. Mr. Shoniber had previously written to the Governor to say that accusations against him were unfounded and all had reasonable explanations. Just the same, the State filed charges against him alleging in the first count of misconduct in office that he inappropriately transferred an OFA boat trailer to a person who is not an employee of OFA. The second count of misconduct in office regards the transfer of an OFA generator in exchange for a pig worth approximately $1500 that was then taken to Shoniber’s home. He later purchased a generator at his own expense but the charges allege that the replacement generator was not as efficient or powerful as the generator he exchanged for a pig in Oroluk. A third charge of theft of services alleged that he directed employees of OFA, during work hours to do personal work for him such as husking coconuts for coconut meal for his own pigs and planting sakau for his personal use. The final charge of misconduct in office alleges abuse of authority. The State claims that he threatened to withhold pay from OFA employees who did not obey or comply with his orders even when those orders were to perform personal services for them. It claims that he also refused to approve applications for leave for OFA employees and used foul and abusive language against them and in some cases threatened bodily harm. It claims that he allowed OFA employees to operate a motor boat while under the influence of alcohol and also allowed OFA employees to fish in a Marine Protected Area and then used the catch for other than immediate personal consumption. It claims that he used staff and government vehicles for personal use during business hours. It claims that he also transferred custody of a boat that had been donated by the Japanese government to a non-OFA employee along with a motor paid for by the FSM. It claims that he used portions of $10,000 given to OFA by the FSM Congress for a trip to the Marshall Islands and that he also used a portion of those funds to buy electronic equipment from his son’s business, which the State says is a conflict of interest. Mr. Shoniber is off island and has not yet been arraigned. He is presumed to be innocent of all charges unless proven otherwise during a court trial. 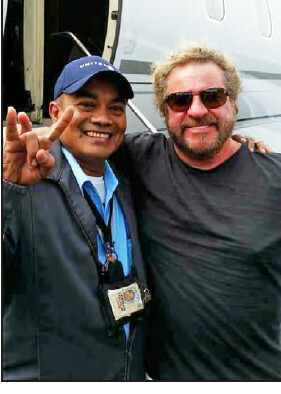 The original “Red Rocker”, Sammy Hagar of Montrose, Van Halen, Chickenfoot, The Circle, and several other bands along with solo projects made a one hour refueling stop in Pohnpei on January 8, much to the excitement of airport employees, some of whom know exactly who the rock star is. Hagar’s family members were also aboard the plane. Sablan said that the Red Rocker and his family were extremely friendly. “We don’t get rock stars every day at the airport. I guess today was the day,” Sablan said. The entire incident made this editor who has followed Hagar since his early days in the 70’s with Montrose and has played lead guitar for rock bands for several decades quite a bit jealous! Sablan said that he never mentioned that he is a singer. Guess he was just a bit too star struck. The Executive Directors of the Phoenix Islands Project Area Trust and the Tasmania Land Conservancy were not able to attend the meeting but will be signing the document electronically and will be considered founding members along with the six funds present at the meeting in December. 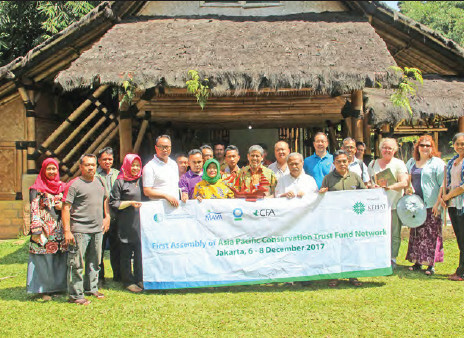 APNET’s vision is that Conservation Trust Funds make the greatest possible contribution to a vibrant and healthy natural environment and sustainable communities in the Asia Pacific region. APNET’s mission is to provide a common platform to promote and facilitate partnerships and collaboration among the members and the wider community of organizations working to achieve a vibrant and healthy environment and sustainable communities in the Asia-Pacific region. Pohnpei—For a couple of weeks now, members of the Pohnpei Boxing Club have had the distinct honor of being trained by World Champion boxer and kickboxer, Andrea Galbiati. During his fighting career Galbiati earned seven championship belts: five titles in his native Italy, one European title and culminating in 2009 as a world champion full contact and kickboxer with the WFC (World Fighting Championship). He says that for the last 10 years he has been training boxers and kickboxers from several gyms in the New York area, including the world famous Gleason’s Gym in Brooklyn, Muhammed Ali’s favorite place to train when he was in New York. Over 130 world champions have trained at Gleason’s including Mike Tyson. Galbiati says that during the last 10 years, he has trained fighters who have competed all over the world, including at the largest US venues including in Las Vegas and at what once was the principal headline fight venue in the world, Madison Square Gardens. He is currently training 10 professional fighters. Fellow Pohnpeians, are you following the prices of some of the commonly purchased imported products by the Pohnpei consumers? It is very heartbreaking following the prices of these imported goods in Pohnpei especially at times when the supply is low and the demand is high. Yes, in business there is this theory called supply and demand. 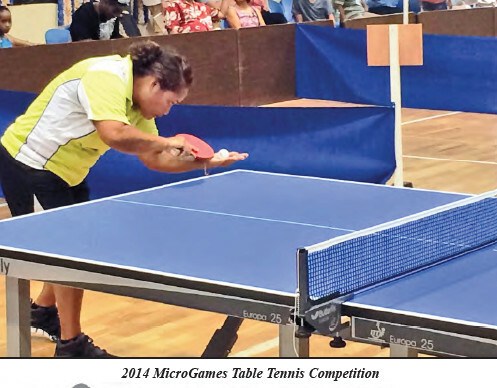 But the way it is practically occurring in Pohnpei is quite interesting and this is where this letter to the editor will sort having highlighted. As a consumer and a Pohnpeian, I feel compelled to share with you my observations having been monitoring the prices of these commonly purchased products during shortage periods. About two months ago or more, a very popular and commonly used pig feed imported from abroad almost ran out on the island and the prices went up from $18.00 plus to $21.00 plus. This is singularly on pig feed grower. After two days, a new shipment brought in new pig feeds and the prices at the businesses selling this product went up to $21.00 plus. Then another shortage occurred at the latter part of last month, this time the price went up to $22.00 plus. SUVA, Fiji- About 770 babies will be born in the Pacific Islands on New Year’s Day, UNICEF said today. Worldwide, it is estimated 385,793 babies will be born globally on New Year’s Day. While many babies will survive, some will not make it past their first day. In 2016, an estimated 2,600 children died within the first 24 hours every day of the year. For almost 2 million newborns, their first week was also their last. In all, 2.6 million children died before the end of their first month. 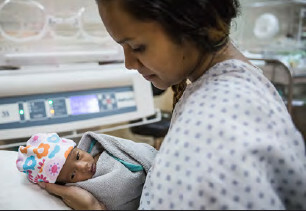 Among those children, more than 80 per cent of all newborn deaths are due to preventable and treatable causes such as premature birth, complications during delivery, and infections like sepsis and pneumonia. Over the past two decades, the world has seen unprecedented progress in child survival, halving the number of children worldwide who die before their fifth birthday to 5.6 million in 2016. But despite these advances, there has been slower progress for newborns. Babies dying in the first month account for 46 per cent of all deaths among children under five. Next month, UNICEF will launch Every Child Alive, a global campaign to demand and deliver affordable, quality health care solutions for every mother and newborn. These include a steady supply of clean water and electricity at health facilities, the presence of a skilled health attendant during birth, disinfecting the umbilical cord, breastfeeding within the first hour after birth, and skin-to-skin contact between the mother and child. One-week training course for Pohnpei obesity control was held in Fukuoka, Japan between 18th and 23rd December 2017 and the following 7 people from the Pohnpei State Departments of Health Services and Education participated in the course. The training course is a part of the project titled INTRODUCTION OF WEIGHT CONTROL PROGRAM FOR OBESITY REVENTION IN POHNPEI, being conducted by Fukuoka Women’s University and the Pohnpei State Departments of Health Services and Education under JICA partnership program. The project is targeting 3 primary school areas (Kolonia, Ohmine and Saladak primary school areas), aiming to establish “Weight control for obesity prevention program" through its pilot programs. Obesity is a major contributor to the global burden of non-communicable diseases (NCDs) today. The prevalence of obesity reported by WHO in 2015 doubled in the past decade, exceeding 10% of the world population (BMI ≥30 kg/m2 male: 10.7%; female: 15.2%). Federated States of Micronesia (FSM) marked much higher prevalence of obesity than the word prevalence (BMI ≥30 kg/m2 male: 31.0%; female: 43.7%). In order to modify the situation, the government and non-governmental organizations have worked together for past years; such as carrying out the national campaign called “Go Local”, however, the latest statistics have indicated more efforts required to lower the prevalence of obesity in the country. 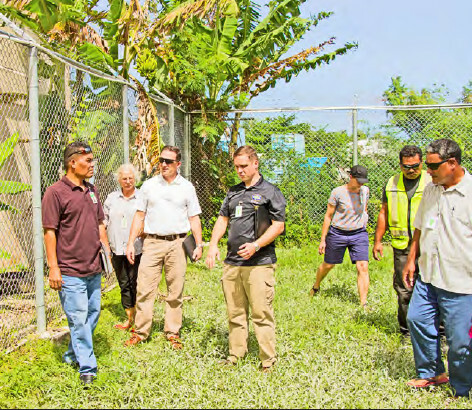 United States — U.S. Department of the Interior Assistant Secretary for Insular Areas Doug Domenech provided a $6.3 million Compact of Free Association grant to support the Federated States of Micronesia’s Sekere Water Project on the island of Pohnpei. Funding for this project will assist the Pohnpei Utilities Corporation in expanding its island-wide water distribution system and connecting to water wells drilled by the United States Navy in 2007 under a Compact-funded humanitarian assistance project. Now in phase two of this project, the overall scope involves the installation of 5 miles of 8-inch water pipeline, significantly increasing the delivery of potable water service to approximately 3,500 people in multiple communities on the island. The project will be implemented by Pohnpei State Government through its Project Management Office with construction undertaken by Adams Brothers Corporation, a Pohnpei-based construction firm. The project is expected to be completed in mid- 2019 and will extend the water distribution system from Sekere in Sokehs to the Lehn Diadi River in Kitti. PALIKIR, FSM — His Excellency Peter M. Christian, President of the FSM, returned this week from delivering a keynote address at the 30th Anniversary meeting of the Montreal Protocol held last week in Montreal, Canada. The international treaty was forged in 1997 to address the global crisis of ozone depletion caused by the release of gases into the atmosphere used in various industrial sectors ranging from air-conditioning and refrigeration to aerosol and pharmaceutical production. In 2009, FSM proposed an amendment to this historic treaty to include a powerful greenhouse gas called hydrofluorocarbon (HFC), which is also used in the refrigeration and air conditioning industries, in the scope of its work. 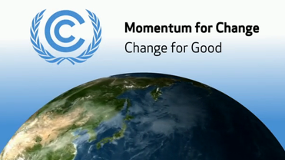 Initially the proposal met with much resistance, in part because the Montreal Protocol (MP) was originally intended to address only ozone depleting gases. Nonetheless, the FSM did not relent. In the lead-up to the 2015 Sustainable Development Summit, FSM secured a commitment from countries in the Pacific Islands Development Forum to support the proposal. Also in 2015, FSM added a focus on energy efficiency to the Island States HFC amendment proposal under the MP and began an advocacy campaign to secure major energy efficiency gains in refrigeration and air conditioning equipment concomitant with any agreed HFC phase down. In 2016, prior to the adoption of the amendment, FSM hosted the Pacific Islands Forum and secured a commitment from all countries in attendance to amend the MP to phase down HFCs. All action, which were instrumental in building consensus and providing the political will, led to the success in Kigali. It took eight years until at the annual Meeting of the Parties in 2016 in Kigali, Rwanda all countries agreed to include HFCs under the Protocol’s work in what is now known as the “Kigali Amendment”. Pohnpei—A new scuba diving services business in Pohnpei is poised to have an impact in Pohnpei well beyond the personal impact on the new proud owners. Laidenki Diving and Tours is in the final stages of the approval process to operate as an official PADI dive business. When that happens, and owners John Ranahan and Anter Joseph along with two of their grandchildren say that it is imminent, Pohnpei will be listed in PADI’s international data base as having a dive operation that functions according to PADI’s strict requirements. It could mean the possibility of divers coming to Pohnpei who might not otherwise have thought about it. And Pohnpei has excellent dive spots. Internationally known dive tour operator, photographer, and author, Tim Rock of Guam said during a conversation several months ago about his book “The 50 Best Dives in Micronesia” (which can be purchased on Google Books and elsewhere) that Pohnpei is one of his favorite places to dive. He said that he dives here whenever he can. The conversation with Mr. Rock was not at all associated with the Laindenki Divers business which at time was only a vague idea in the owners’ minds but did speak volumes about what Pohnpei has to offer to divers. The largest gathering of international civil society organizations in the Pacific region was recently held in Suva Fiji from 4-8 December 2017 at the University of the South Pacific Laucala campus. Over 800 delegates representing over 100 plus organizations from around the world attended what is billed as International Civil Society Week (ICSW), hosted by CIVICUS (World Alliance for Citizen Participation, based out of South Africa) in collaboration with PIANGO (Pacific Islands Association of NGO’s). Former New Zealand Prime Minister Helen Clark attended to show her strong conviction that governments must provide enabling environments for civil society participation. Dame Meg Taylor, the Secretary General of the Pacific Islands Forum was a guest speaker at several events during the 2 day meeting. Asked why Pacific islands need particular attention, Dhananjayan Sriskandarajah, the secretary general and CEO of CIVICUS, the global civil society alliance, told IPS the Pacific region has been at the forefront of global issues, from climate change to nuclear non-proliferation. 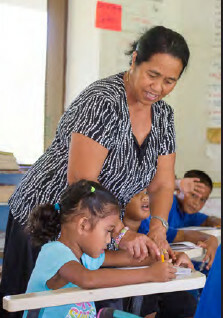 Awak, U, Pohnpei—Lolihna Edward-Ladore has lovingly taught first graders at Awak Elementary School for over 37 years. She currently has 19 students in her class room who, from all appearances during our short time in her classroom, respect and adore her. During her lengthy career she has taught approximately 800 students. One of those students was Peter Ramirez. As principal of Awak Elementary School, Ramirez is now Ladore’s boss. She says that she currently has students in her class whose parents and grandparents were also her students. When her students and former students see her on the streets they call out to her, “Hey! Hi, my teacher! I can see their faces but I can’t always remember their names,” she says, but it is apparent that she loves them all. She couldn’t pin down any one particular happy memory during her years of teaching. “When I see the kids, I’m really happy to see them. Sometimes they make me happy. Sometimes they make me sad but I always make them happy,” she says. Clarifying, she said that sometimes children come to school but they are sad to be there because of problems of some kind at home. She wants them to be happy to be at school and learning with friends and works with them until they are. Her classroom walls are covered with so much information. Want to know what 9+3 is? You can find the answer on her blackboard. Can’t remember how to count to 100? A large hand written chart on her wall can remind you. When we were there she took time with individual students to answer questions about a paper they were working on. Though they squirmed excitedly as first graders do and were distracted by my presence in the classroom, Ladore never lost patience with them as she went from desk to desk praising and encouraging them. She said that when she first started as a teacher in 1980, lesson plans were done on a day by day basis. Now lesson plans are due every Friday for the following week. She says it’s a lot of work but that it makes much more sense. “It’s easier to know where you’re going with a plan.” It’s also easy if a substitute teacher is called in to teach a class due to illness or other reasons. 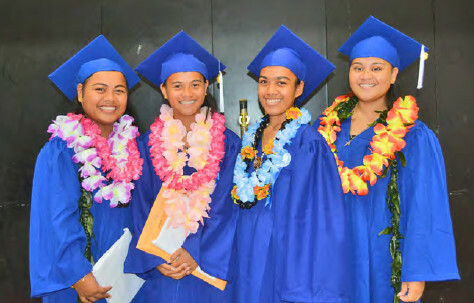 She said that she also has more resources for teaching now than she did when she started as a new teacher during the FSM’s Trust Territory days after she graduated with an Associates Degree at the Community College of Micronesia. She says that although not every child has a text book there are “enough” to get the job done. As much as she loves teaching, she says that she is also looking forward to retiring. 24 JAN We are back! 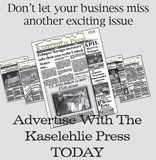 FSM—After 10 years the website for The Kaselehlie Press will be going offline at least for a time. For over 10 years, Bernd Riebe has hosted and maintained the website of The Kaselehlie Press on a pro bono basis on his server in Germany. For all of those years, Riebe has copied all of the images from the PDF version of the newspaper that we send to subscriber, resized, named and uploaded them. He has copied and converted the PDF text into plain text, pasted and organized the articles on the system, selected featured stories, archived older articles, updated the CMS system and all of the plugins, and many more tasks simply because he felt that by helping The Kaselehlie Press he was helping the people of the FSM. And that he was. The website has attracted an average of 25,000 unique users per month. The vast majority of those users have been in the United States though there have been users from all over the world who have taken advantage of the news provided on the website.